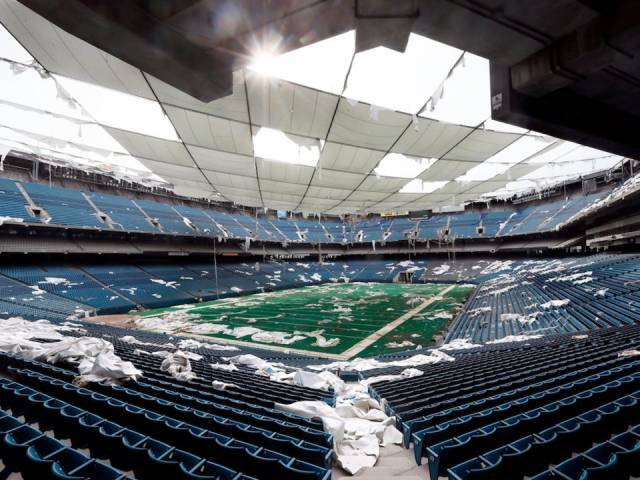 The Pontiac Silverdome was once home to major events like the Super Bowl and concerts by The Rolling Stones, The Who, and Led Zeppelin. However, since the Detroit Lions left back in 2002 it has been empty and abandoned. It is now in the process of being demolished. 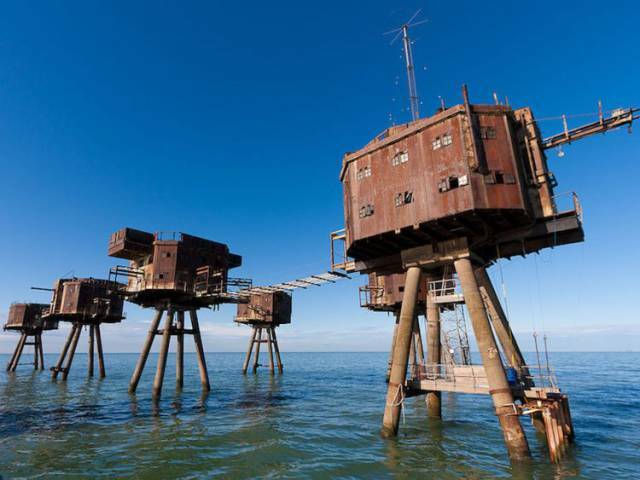 During World War II, the Maunsell Army Sea & Air Forts were built to defend England against German forces. A group of forts raised above the water on stilts made up the complex, designed by Guy Maunsell, a British civil engineer. This mid-century-style hotel opened in 1971, drawing visitors to the small Croatian island of Krk. A year later, the founder of Penthouse Magazine, Bob Guccione, invested $45 million in the property and expanded it, turning it into the lavish Penthouse Adriatic Club Casino. 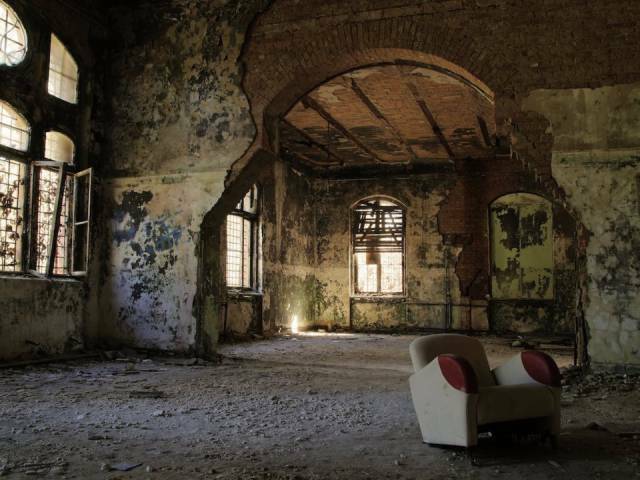 Once the Yugoslav Wars began in the early 1990s, Krk was no longer a popular travel destination, and the hotel was eventually abandoned. In its prime, it was home to British government officials, as well as a penal settlement set up after the Indian Rebellion of 1857. The British residents made it their home with extravagant dance halls, bakeries, clubs, pools, and gardens, until 1941 brought an earthquake and an invasion by the Japanese. Ross Island was then alternately claimed by the Japanese and British until 1979, when the island was given to the Indian Navy, which established a small base there. 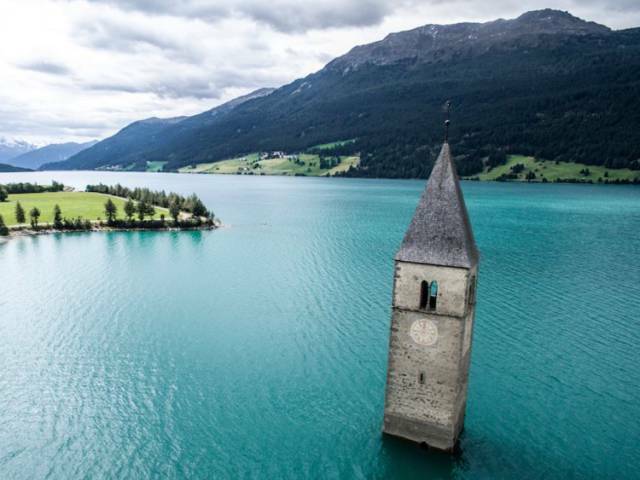 Graun Church on Lake Reschen in South Tyrol, Italy, was once a regular Italian church. However, an artificial lake was built in 1950 in order to provide the town with electricity, drowning the historic church. Today, all that remains visible is the church's bell tower, which looks as though it's floating in the middle of the lake. This eerie military hospital once treated Nazi leader Adolf Hitler for a thigh injury he acquired during a WWI battle in late 1916. It was built in the late 19th century to help rehabilitate tuberculosis patients in Berlin, but was later abandoned during the fall of East Germany. The chilling building was used as a set for Oscar-winning film, "The Pianist." Jonestown, Guyana, was the location of one of the most shocking tragedies in American history, as 909 members of the People's Temple died from cyanide poisoning at the direction of a cult leader. 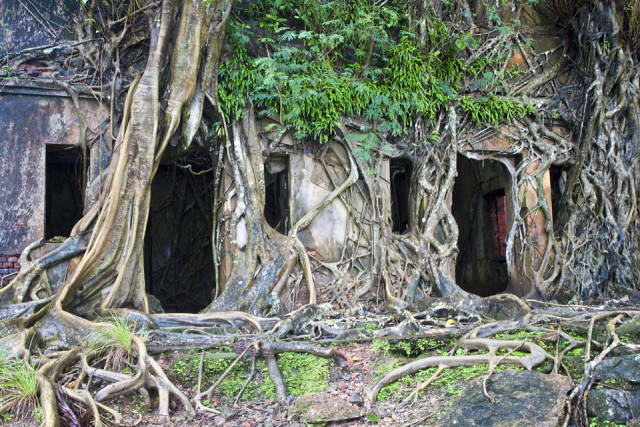 The village where the cult resided is now mostly covered in dense jungle vegetation, although a few structures still remain. Completed in 1904, City Hall station was the first southern terminal of the first line of the New York City subway. 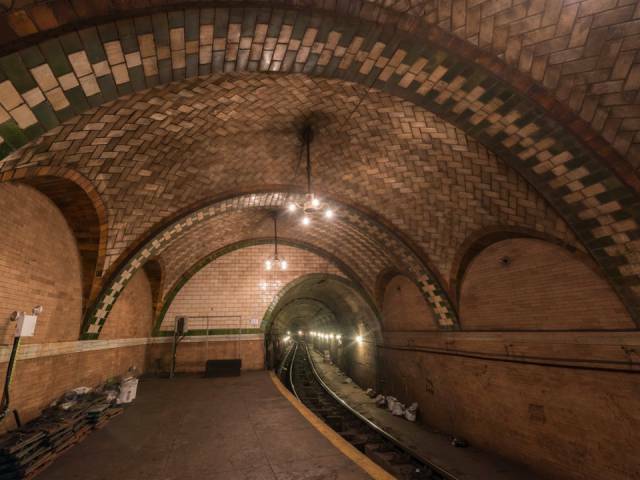 Built to impress New Yorkers with their swanky new mode of transportation, the station featured Roman brick walls, brass chandeliers, and vaulted arches. It closed in 1945 as it could no longer accommodate the growing ridership, but apparently you can still see it if you stay on the 6 train after its last stop, on its way back uptown. 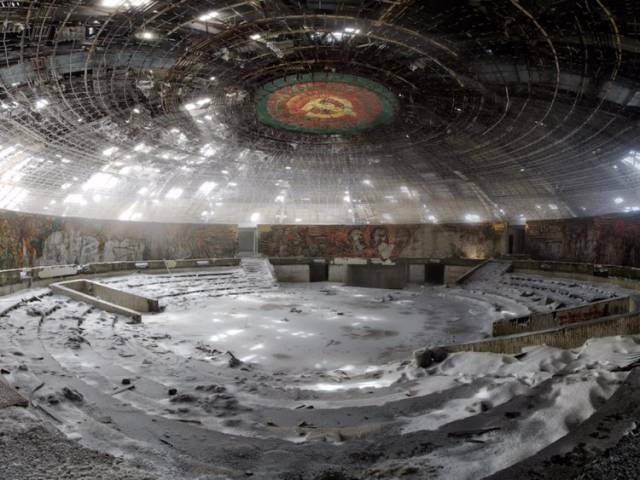 This abandoned monument, which sits high in the Bulgarian mountains, was once the House of the Bulgarian Communist Party. In power during the height of Soviet influence, the party decided to erect the monument to commemorate socialist communism. However, the site was abandoned after the government's fall from power in 1989. After 400 years of dormancy, Indonesia's Mount Sinabung has been erupting in recent years, causing various villages on its slopes to be evacuated. They remain abandoned, declared too dangerous to inhabit. Simacem is one such town, and filled with the remains of lives hastily left behind. Lynch, Kentucky, was at one time the largest coal camp in the world, with around 10,000 residents at its peak. It even had its own power plant, which was built in 1919. 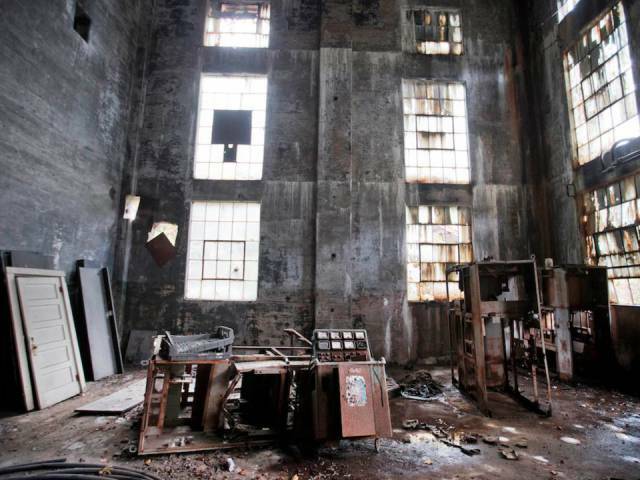 However, as coal declined, so did the city, and the plant — and most of Lynch — now sits abandoned. 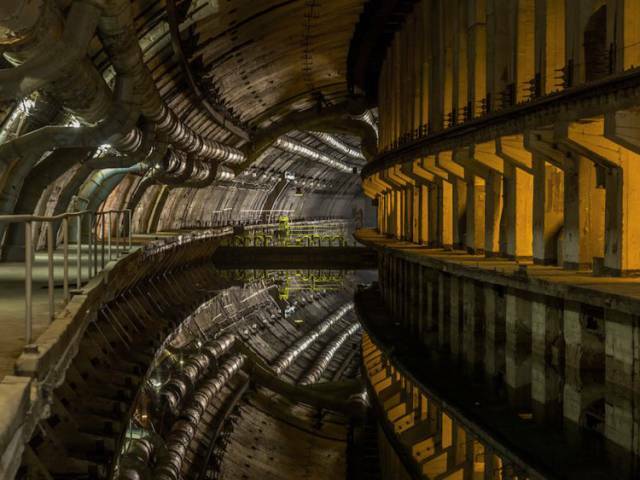 This abandoned aquatic facility was originally built by the USSR as a top-secret plant designed to house a fleet of nuclear-ready, Soviet submarines during the Cold War. The complex remained untouched for a long time, until the Russian Federation gifted the abandoned base to the Ukrainian Navy in 2000. It is now a museum. Kolmanskop was at its liveliest in the early 1900s, when German miners came to the area to hunt for diamonds. With them, they brought German architecture, giving the desert area an opulent, out of place look. The town featured a ballroom, a hospital, and a bowling alley among other amenities. The town's decline began shortly after World War I, but the final nail in the coffin was the 1928 discovery of a diamond-rich area along the coast. Most of Kolmanskop's residents hurried to the new hotspot, leaving their belongings and the town behind. Kolmanskop has been slowly getting eaten by the desert ever since. 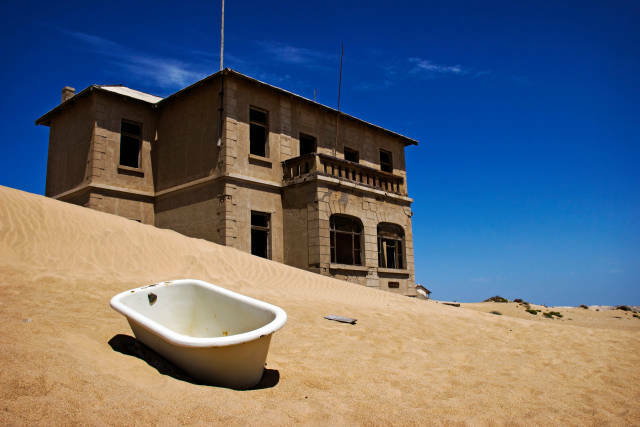 Tours to Kolmanskop can be booked in the nearby coastal town of Lüderitz. In its heyday, the Orpheum Theatre was a prime example of Beaux-Arts architecture, thanks to its flat roof and symmetrical design. Its interior was equally impressive. It first opened on April 15, 1912, the same day that the Titanic sank. The space also boasted a large ballroom, gymnasium, and a shooting range, making it a popular event space in New Bedford. 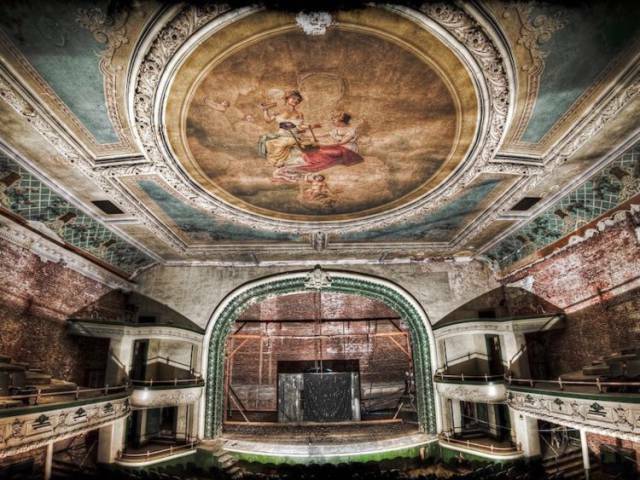 The building has gone through several owners since its closure in 1962, and plans have been in the works to reopen it as a community theater in recent years. 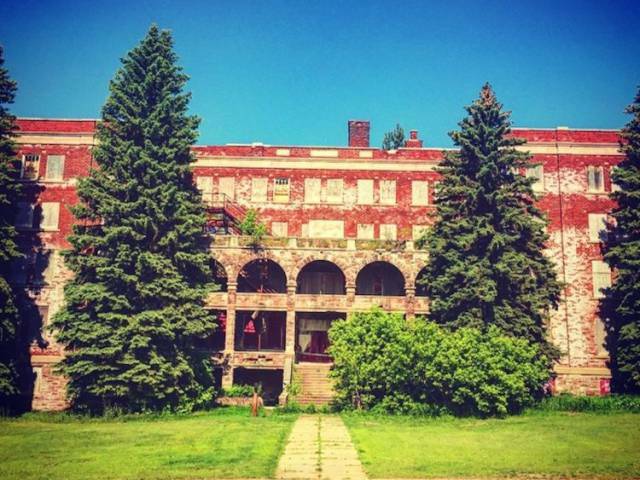 While it has not yet reopened, urban explorers frequent the site and claim that it's haunted. Humberstone is a former English saltpeter mining town in the Atacama Desert. Synthetic nitrate invented during WWI replaced saltpeter, meaning that the facilities were no longer needed. People left so abruptly that much of the town appears frozen in time, with pictures still hanging on walls, and closets filled with clothes. 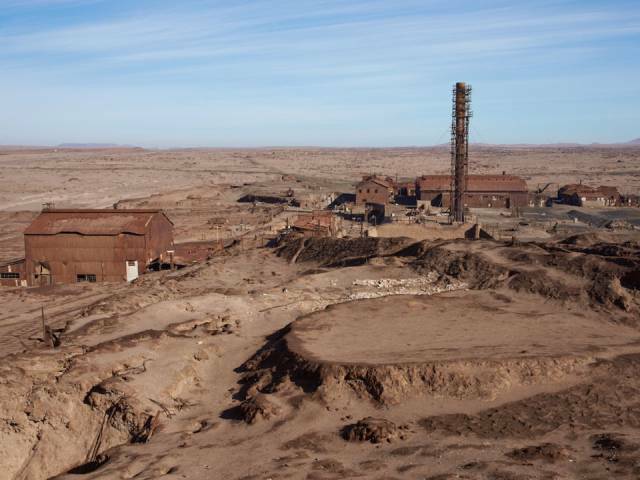 In 2005, Humberstone was declared a UNESCO World Heritage Site. 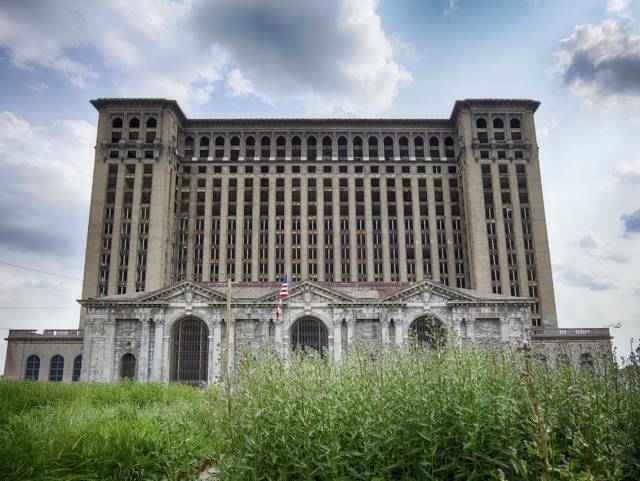 Although Michigan Central Station was once the tallest train station in the world, it has been abandoned since 1988, when Amtrak stopped running there, and has become a symbol of Detroit's decline. Although you'd expect ancient ruins in Athens, these modern facilities fell into disrepair sooner than expected. 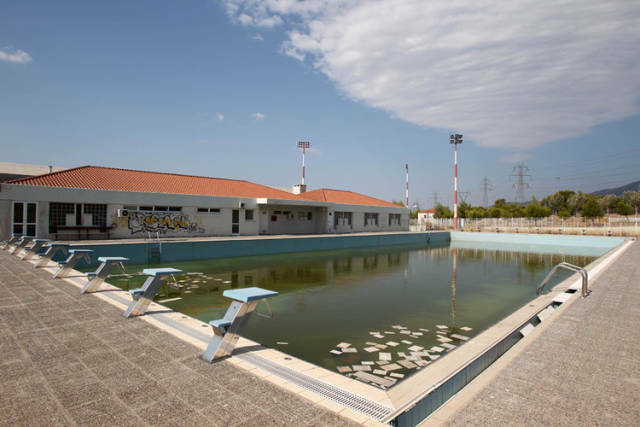 After hosting the Olympics in 2004, Greece simply had no use for world-class, expensive-to-maintain venues for niche sports like softball, beach volleyball, or even swimming, so they became useless immediately after the Olympics left town. This large wooden building on Büyükada, off the coast of Turkey, was originally designed to be a luxury hotel and casino. However, due to issues with permits, the building was sold and eventually turned into an orphanage in the early 20th century. 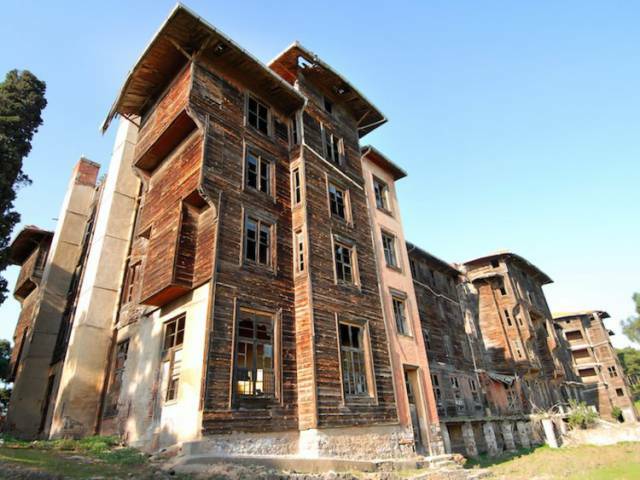 After ending operations as an orphanage in 1964, the building remained unoccupied for decades. In 2012, restoration began to turn the site into an environmental institute. 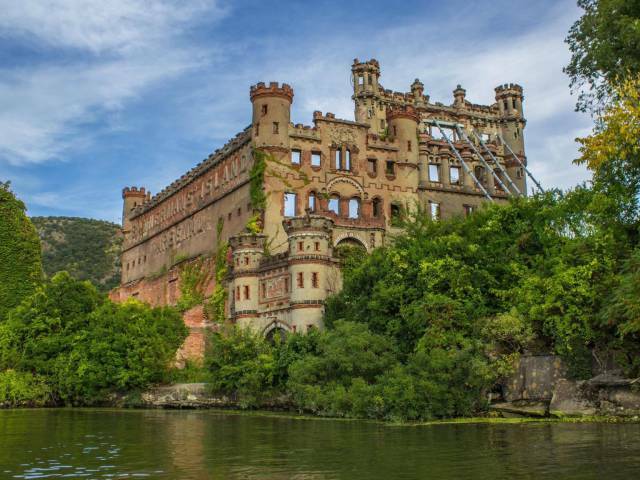 Located on Pollepel Island on the Hudson River, Bannerman Castle once acted as arms storage for Frank Bannerman, a Scottish munitions dealer in New York City. Bannerman and his wife eventually built a glamorous, castle-like home on the property, and resided there during the summer. After a powder explosion in 1920, several fires, and various changes in ownership, the castle is not the breathtaking sight it once was, but Bannerman's name can still be seen plastered on what remains of its facade. Today, visitors interested in the historic site can tour the island via passenger boat or kayak. 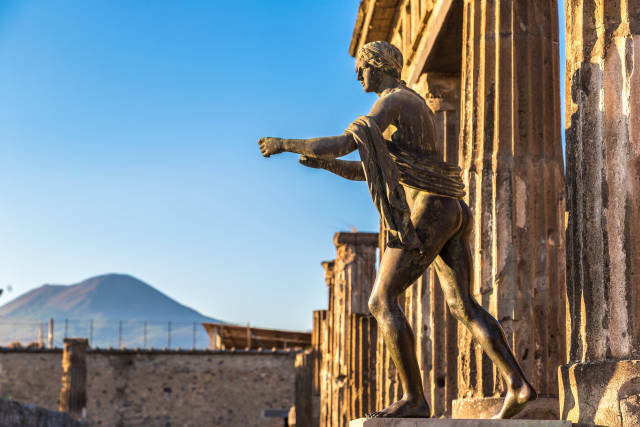 One of the most famous eruptions of all time, Mount Vesuvius' 79 A.D. eruption completely buried the ancient Roman city of Pompeii under a thick blanket of volcanic ash. The city was abandoned for nearly 2,000 years, until explorers discovered it fully intact underneath 20 feet of dirt and debris in 1748. Many of the abandoned structures are still standing today, and can be visited. 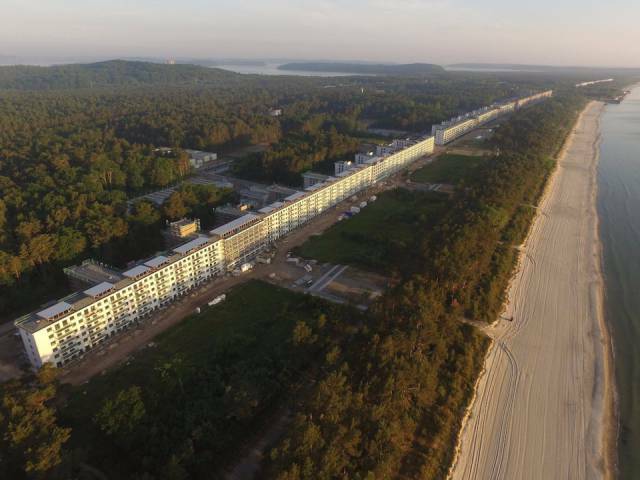 Three years before Germany invaded Poland in 1939, Adolf Hitler ordered the construction of a three-mile-long tourist resort on the island of Rügen called Prora, then the largest resort in the world. When World War II began, however, Prora's construction stalled and it was left abandoned for several decades. 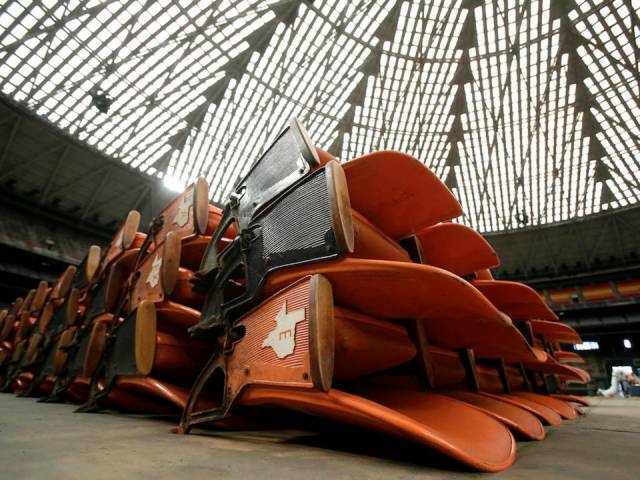 The world's first domed stadium, The Astrodome, has been abandoned since the Houston Astros baseball team left it in 2003. A staple of Houston's city skyline, the stadium remains abandoned, with no plans to be demolished. Aniva is a coastal town on Russia's Sakhalin Island, near Japan. The Mys Aniva lighthouse sits on the rocky coastline, abandoned and worn down. 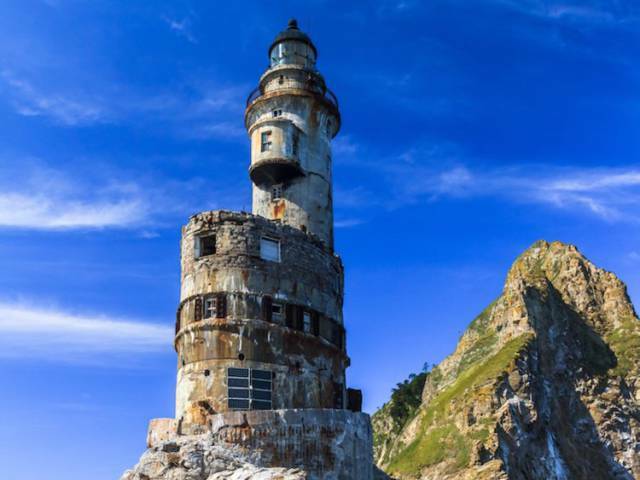 The lighthouse was built by Japanese engineers in 1939, and was used by both Japanese and Russian militaries over the years. The site is popular today among urban explorers, some of whom have found belongings of people who once lived in the lighthouse. 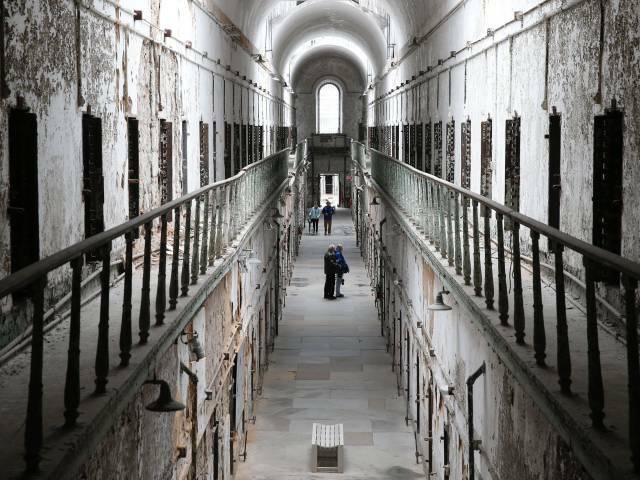 The spooky Eastern State Penitentiary was once the most famous prison in the world, but now stands in ruins. It once held many of America's most notorious criminals, including "Slick Willie" Sutton, an American bank robber, "Scarface" Al Capone, the Chicago mob boss, and Freda Frost, a female inmate who poisoned her husband. 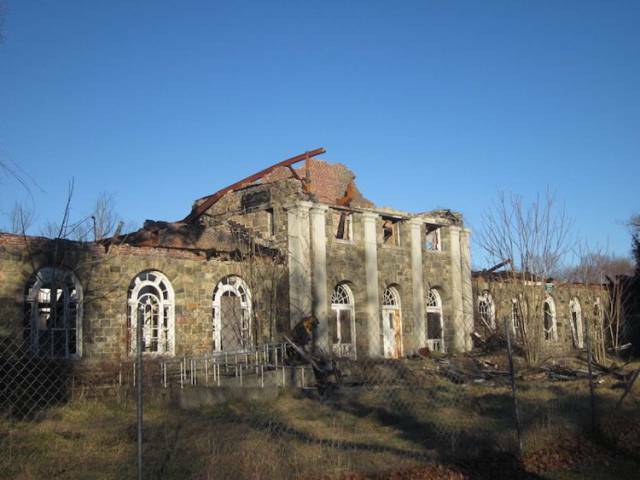 The Saint Nicholas Church was built in 1850, but has been abandoned for about 100 years. 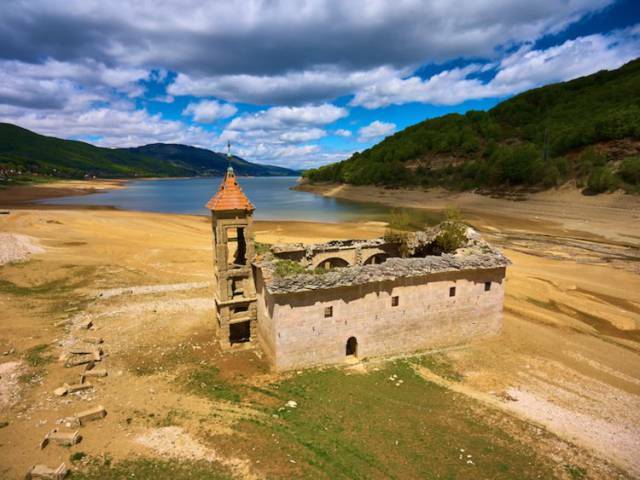 When Lake Mavrovo, which is manmade, was created, a dam filled the surrounding area with water. However, since the area has experienced droughts in recent years, it is possible for visitors to enter the the ruins of the church. 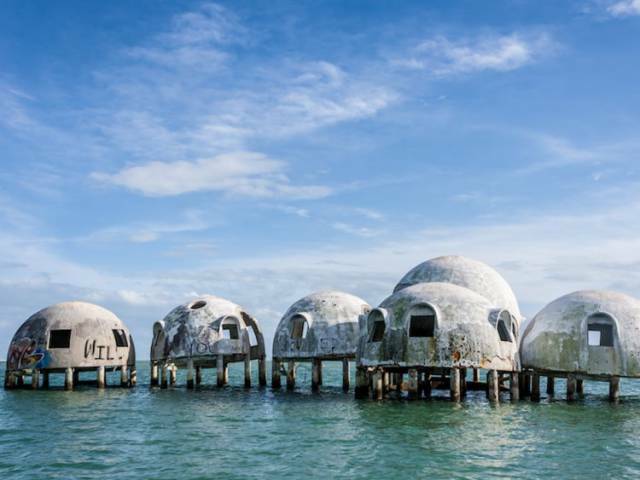 These concrete dome-shaped structures may look futuristic, but they're actually just the vacation home of a retired oil producer. Bob Lee built the dome homes in 1981 as an environmentally friendly and self-contained getaway for his family on Marco Island, Florida. While the pods once stood on their concrete pylons right on the beach, erosion has resulted in their current location in the ocean. While unlivable today, the igloo-like structures are still standing right off the coast of Marco Island. The crash of the steel industry hit Gary, Indiana, hard in the 1970s. This economic depression resulted in the abandonment of many once-popular buildings, including the City Methodist Church. The church reportedly cost a whopping $1 million to build back in 1926, which would be about $7 million by today's standards. However, despite all the work that went into building the beautiful English Gothic style church, the parish officially closed in 1975. Since its closure, the City Methodist Church has not gone entirely untouched. The site has acted as a shooting location for several movies, including "A Nightmare on Elm Street," "Transformers 3," and "Pearl Harbor." 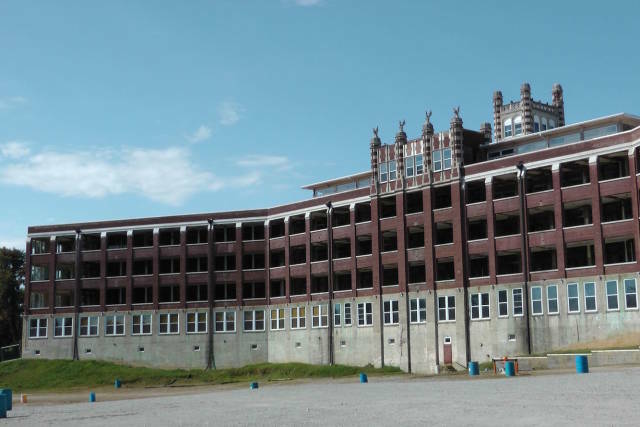 The Waverly Hills Sanatorium acted as a hospital in which patients with tuberculosis were quarantined in the early 1900s, although the building that still stands today was not completed until 1926. The hospital operated until 1961, when an antibiotic that cured tuberculosis was discovered. Today, many people believe that the site is haunted. Visitors can participate in ghost tours, haunted houses, and laser light shows on the hospital grounds. Commonly known as the "Ghost Tower," the Sathorn Unique Building in Bangkok is an abandoned skyscraper that's shrouded in mystery. The luxury high-rise was built in the 1990s, although construction was abruptly halted upon the 1997 Asian Financial Crisis. 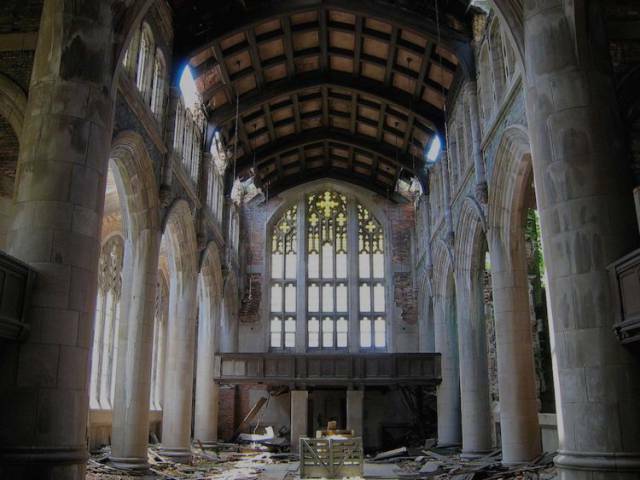 As a result, the building has fallen into decay and has become a haven for urban explorers. The inside of the tower is covered in graffiti. While climbing to the top of the building is really dangerous, visitors can still get a glimpse inside from the ground floor of a nearby parking garage. 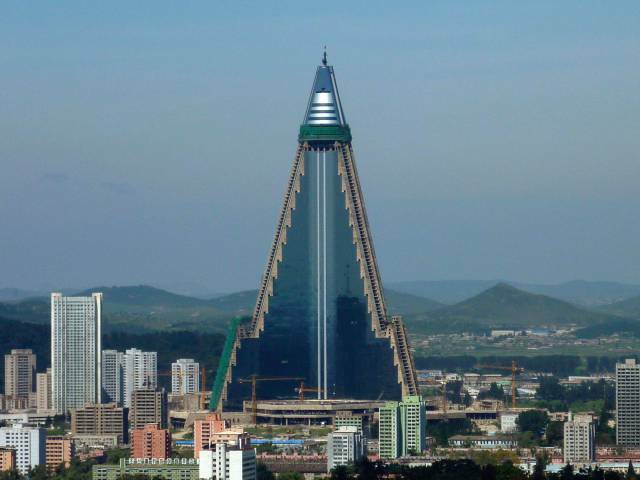 At 105 stories with a striking triangular shape, the Ryugyong Hotel in Pyongyang towers over much of the city. Construction on the building began in 1989 with plans of containing Japanese lounges, casinos, and night clubs. 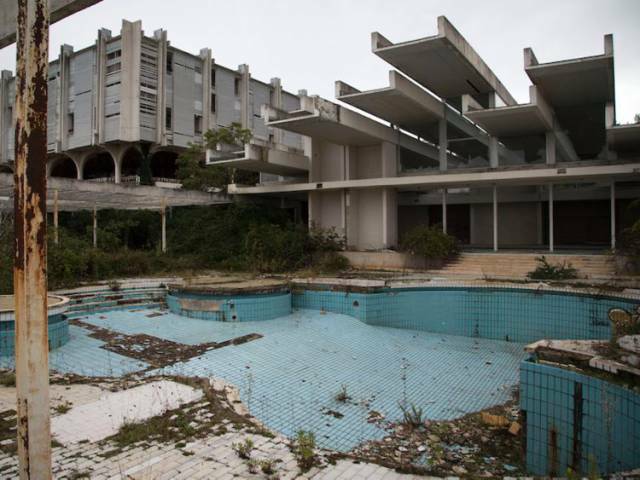 However, the hotel has remained unfinished for decades. 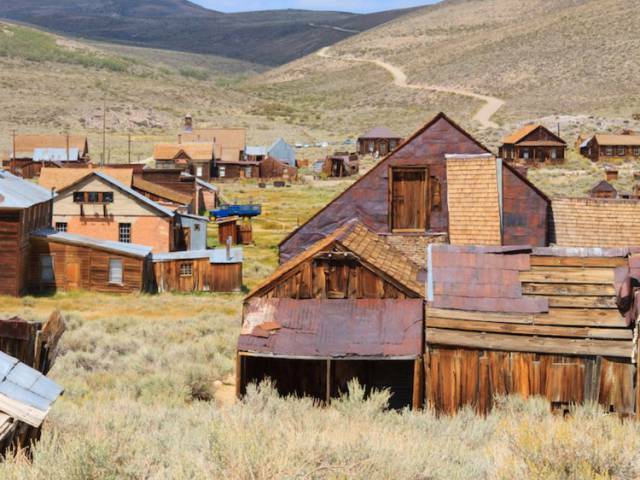 Bodie, California is just a few hours south of the popular vacation town of Lake Tahoe, but it feels like a step back in time to the Old West. This ghost town, which is now a state park, had its heyday during the California gold rush in the late 19th century. Today, the park aims to keep the town as authentic as possible. Every summer, the park offers nighttime ghost tours that take visitors to Bodie's church and 106-year-old abandoned mill. 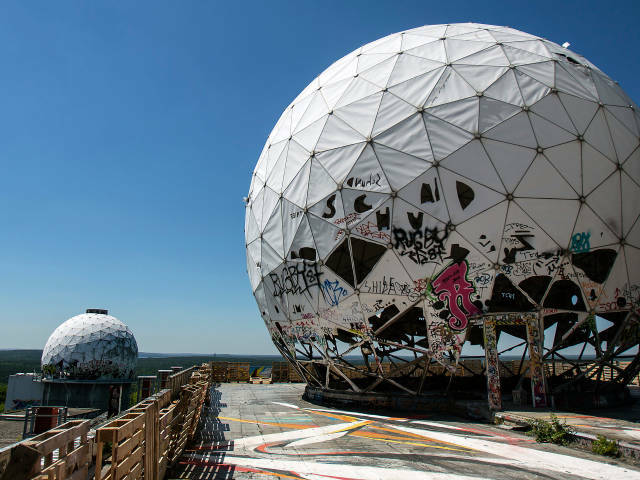 Located in Berlin, Teufelsberg ("Devil's Hill") is a man-made hill built out of rubble after World War II. During the Cold War, the dome-like structures were added and used as US listening stations. Antennas and satellite dishes were built on the site in order to intercept radio signals from East Berlin. The futuristic-looking structures that stand in Flushing Meadows Corona Park actually date back to the early 1960s, when they were built for the New York World's Fair in 1964. 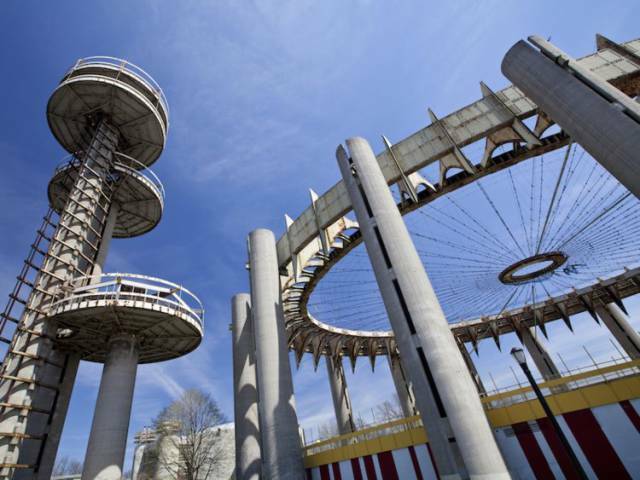 A dream team of architects, including Philip Johnson, Richard Foster, and Lev Zetlin, designed the complex, which includes observation towers, a theater, and a tent that once had a cable suspension roof. While the fairgrounds have been empty for decades, a massive restoration of the complex that will make it suitable for visitors is underway, and is set to be completed by 2019. 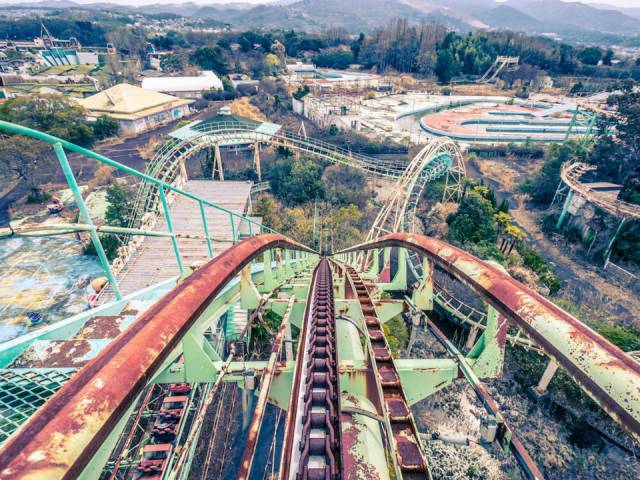 Built in 1961, Nara Dreamland was inspired by California's Disneyworld in the US, but it fell into disrepair after closing in 2006 due to dwindling visitor numbers, according to Atlas Obscura. 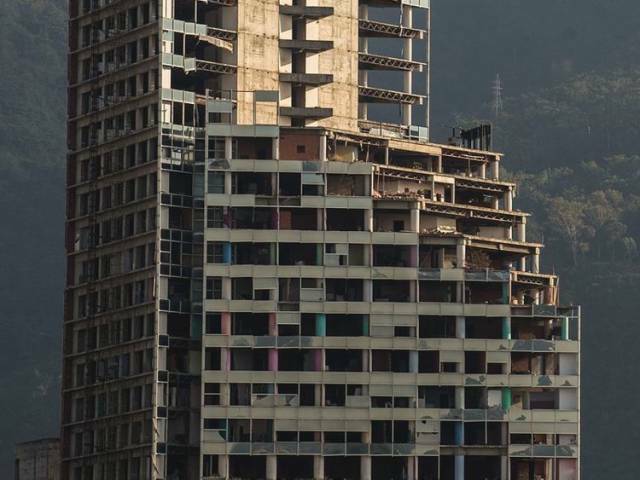 This unfinished skyscraper in Caracas is more commonly known as "The Tower of David." Construction on the building, which was intended to be a financial center, began in 1990. However, after the death of one of the project's main investors and an economic downturn in Venezuela, construction came to a halt in 1994. 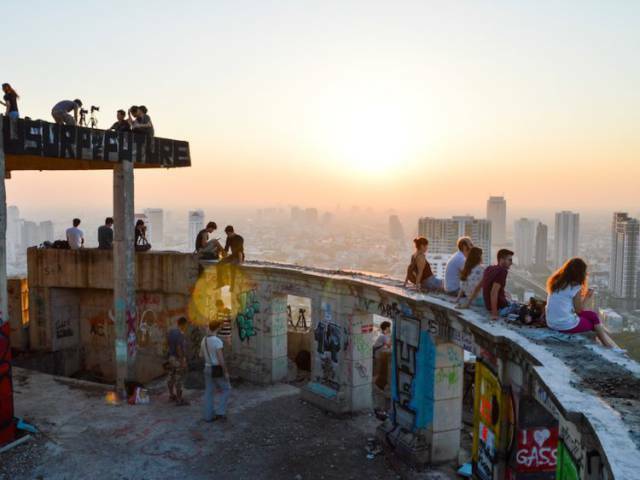 Squatters then took over the unfinished tower, creating a large community within the building that even came to include electricity, though all residents were evicted by 2015. The future of the building is still uncertain. 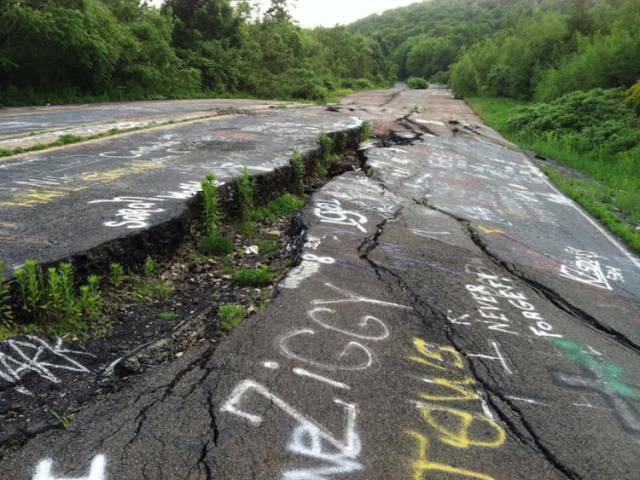 Until 1962, Centralia was just like any other coal mining town in central Pennsylvania. However, after a fire at a landfill spread to several local mines, the town became uninhabitable. As the fire grew, it moved through the mines and underneath the town, creating health safety issues for residents. Today, Centralia is completely abandoned, although it is full of eerily empty streets, houses, and businesses. You can still see steam rising from the ground in many areas, including on an abandoned strip of road that has become known as "Graffiti Highway." Many mining towns were built quickly and cheaply in order to allow miners to start working as soon as possible. This was the case in Garnet, Montana, a 19th century town that was once home to 1,000. 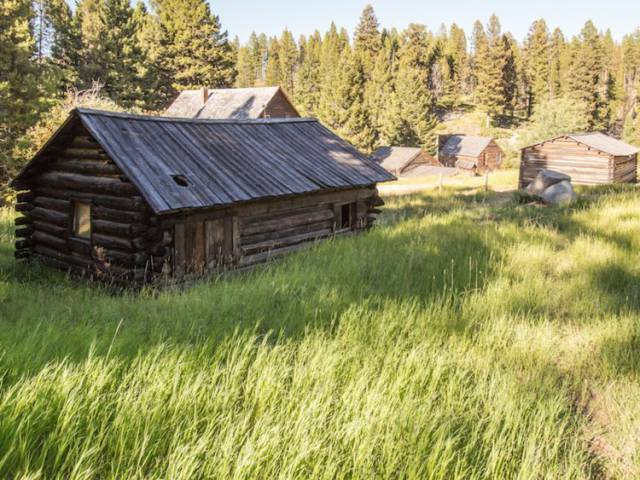 Garnet is now known as Montana's best-preserved ghost town, and log cabins, schools, and saloons that were once home to gold miners and their families can be explored for only $3. There are campgrounds nearby for people looking to get an overnight experience. 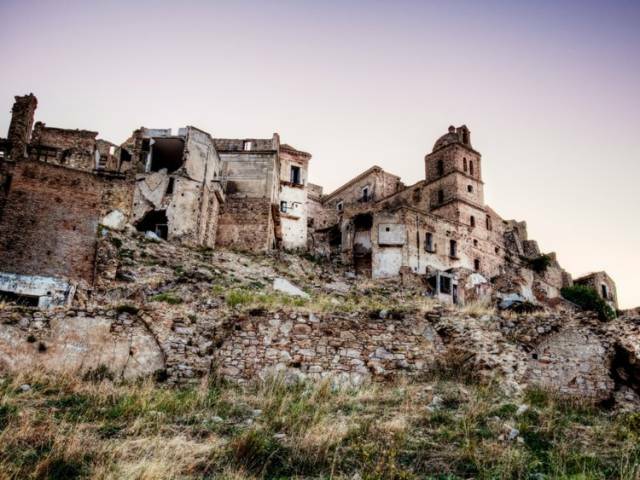 This hillside ghost town was founded in the 8th century, and sits on a cliff that's 1,312 feet off the ground. The city emptied due to various natural disasters. In 1963, many evacuated after a landslide; in 1972 a flood made conditions even more precarious; and in 1980 an earthquake caused the town to be abandoned in its entirety. A locked gate surrounds the city, so visitors must book a guided tour. Thanks to a miraculously unscathed statue of the Virgin Mary, the town hosts various religious festivals throughout the year. And despite the fact that the area is a ticking time bomb, the city has been used for several films, including "Passion of the Christ." 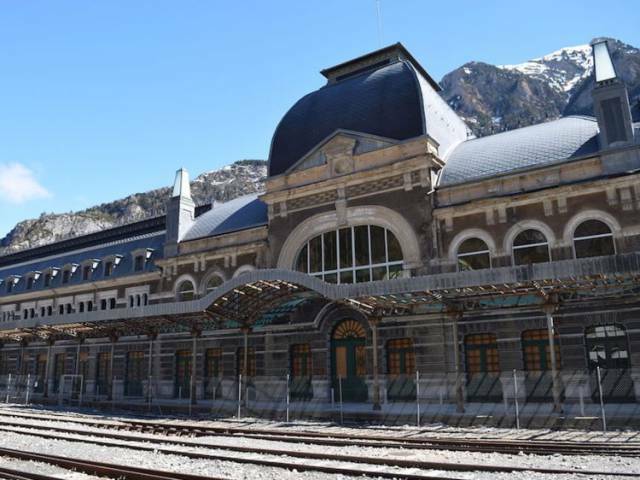 Located in northeastern Spain near the French border, the Canfranc International Railway Station was once a luxurious and architecturally beautiful stop for those traveling Europe by train. However, the station was taken over by the Nazi regime in the early 1940s, halting regular travel. After World War II, a train crash in the 1970s damaged the tracks, causing another closure. While the building is no longer utilized as a rail station, parts of the station are now used as a laboratory by the Spanish government. The SS Ayrfield was frequently used during World War II, often traveling back and forth from Newcastle to Sydney, Australia. However, after the ship was retired in the 1970s, it took on an entirely new purpose. 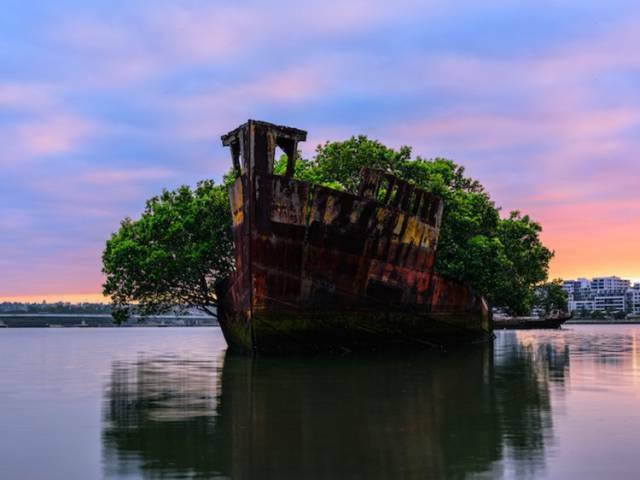 The ship was abandoned in Homebush Bay in Sydney, not far off shore. 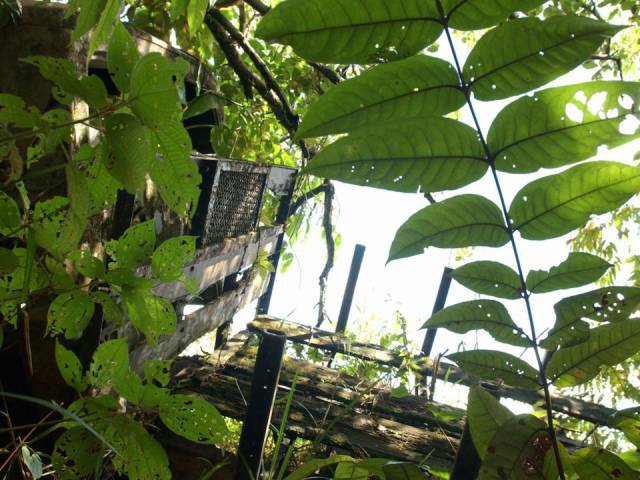 Plants began to grow on what remained of the ship's hull, which eventually turned into a lush forest. Today, you can spot fully grown mangrove trees on the abandoned ship, providing a unique contrast with the hull's rusted exterior. This empty boys school in Berkshire, New York, has been abandoned since the late '80s, after a high-profile child abuse case came out and forced the school's closure. 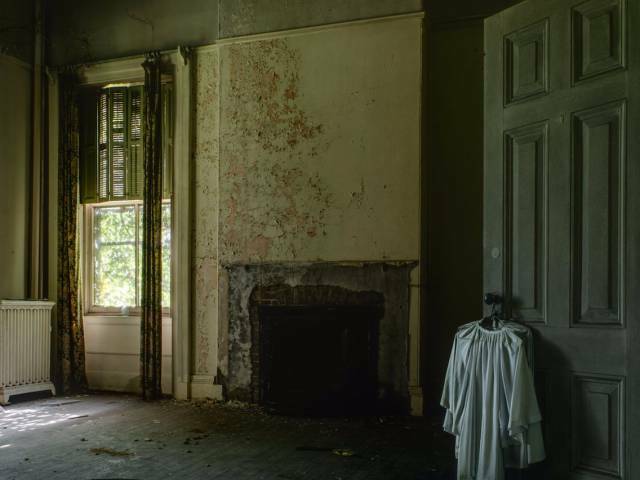 A photographer who visited the building told Daily Mail, "I felt emotional as I walked around. I wondered what terrible things had happened in the rooms which are now eerily empty. It's horrible to even imagine." Four former staff members have since been jailed, and the building remains in creepy ruins. Once a sprawling campus with stately buildings, Letchworth Village is a now-defunct mental institution that has fallen into deep decay. Despite being ahead of its time (it tested the first polio vaccines in the 1950s) it closed in 1996, after years of reports of abuse and horrible conditions. While most of the buildings are covered in graffiti both inside and out, it is still possible to view some aspects of the original architecture and uses for specific hospital buildings. 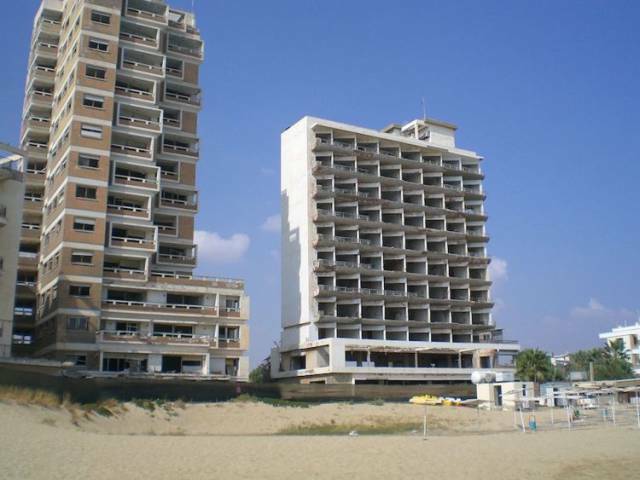 Varosha, a town on the island of Cyprus, was once popular among tourists, though the entire beachside community is abandoned today. Elizabeth Taylor and Brigitte Bardot both visited Varosha back in its prime, according to the Daily Mail. However, after Turkish troops invaded and occupied the region in 1974, hotels and businesses lost their customers and became vacant. Today, many beachfront hotels still stand, overlooking the ocean, although they remain empty. 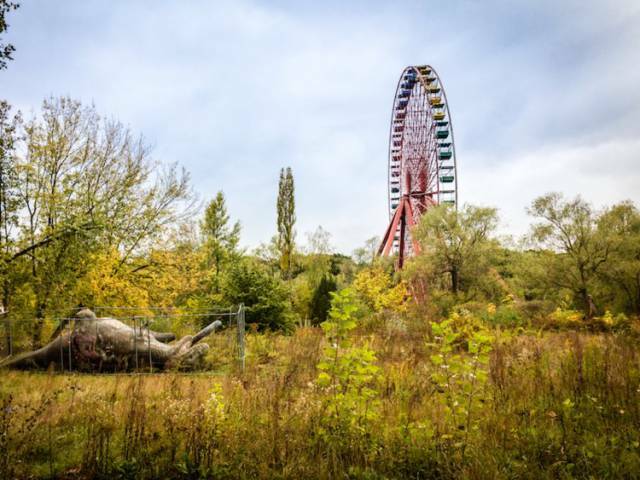 Spreepark was built as a dinosaur-themed amusement park by the communist government outside of Berlin in 1969. 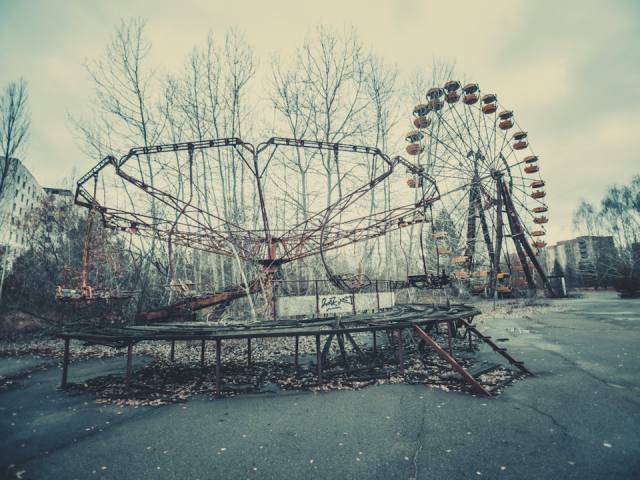 While the park's popularity flourished in its early years, it was finally closed down in 2002 due to lack of interest. While many abandoned buildings and parks are closed off to visitors, guided tours of the ruins of Spreepark are available. 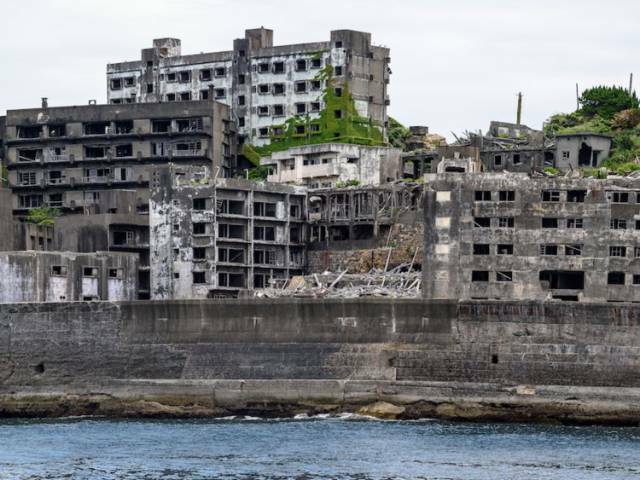 Hashima Island was once known for its undersea coal mines, which began operations in 1881. The island hit peak population in 1959 with over 5,000 residents (mine workers and their families), but once the mines started to run dry in 1974 most people left. 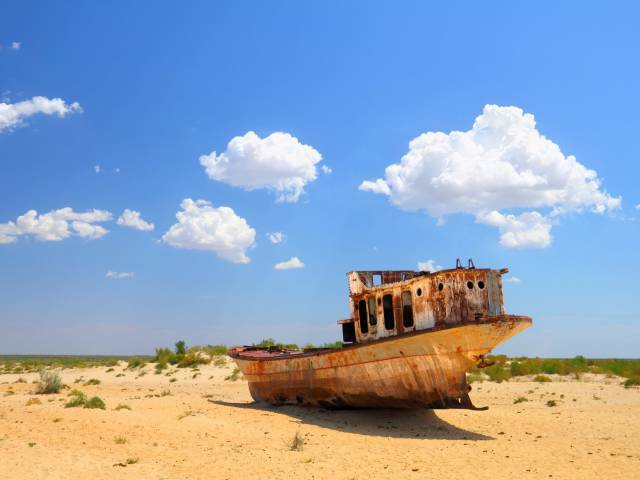 The once-thriving island is now completely abandoned, with the exception of the sightseeing tours that drop off boatloads of tourists each day who come to see the abandoned homes, stores, and streets. The island was also featured as a villain's lair in the Bond movie, "Skyfall." This abandoned building has served a lot of different purposes. 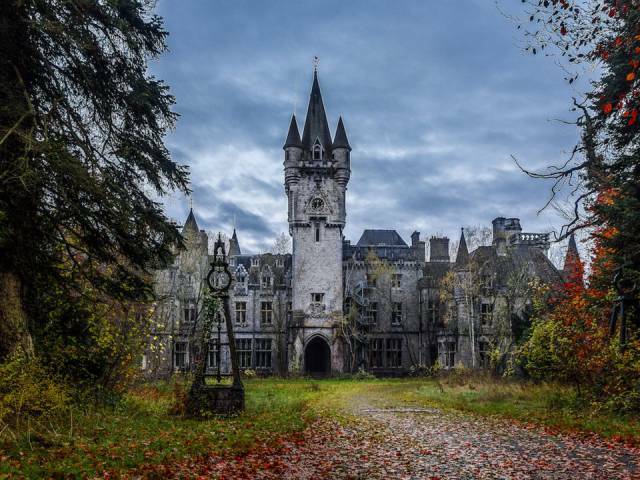 It was originally built by French aristocrats who were fleeing the guillotine, later became an orphanage, and is now just a ruin. Although its owners got several offers, they refuse to sell it, instead letting it fade into its surroundings. 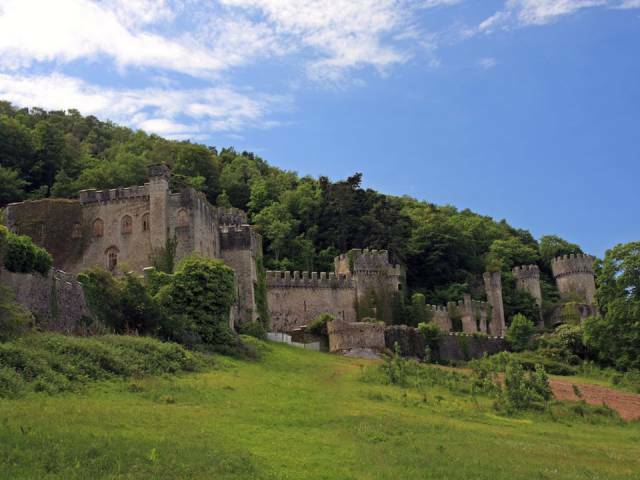 Built in the early 1800s, Gwrych Castle once had a total of 128 rooms, including 28 bedrooms, an outer hall, an inner hall, two smoke rooms, a dining room, a drawing room, a billiards room, an oak study, and a range of accommodations for servants. During World War II, it housed 200 Jewish refugees, and was later open to the public. Although the castle has long been vacant, it was bought several years ago with the intention of being converted into an opera house and luxury hotel, but those plans never came through. 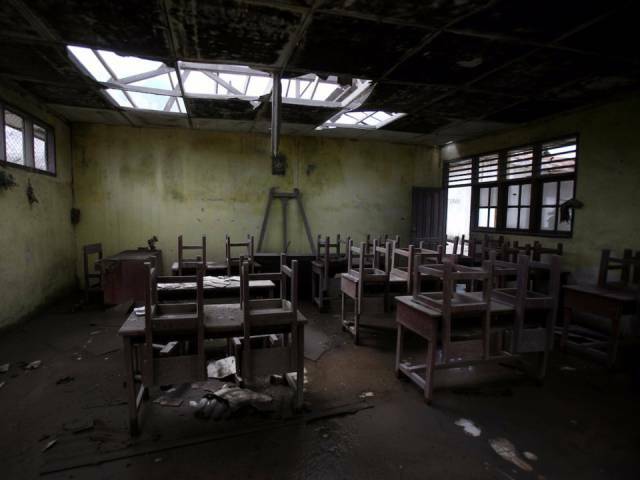 Once home to 200 children, classrooms, dormitories, playrooms, a dining hall, and other facilities, Holy Family Orphanage closed its doors in 1965. A plethora of urban legends and stories surround the orphanage, including the mistreatment and death of some of the children housed there over the years. Some say you can still hear the children playing. The spooky building is now in the process of being renovated and turned into apartment buildings for residents who are brave enough to move in.